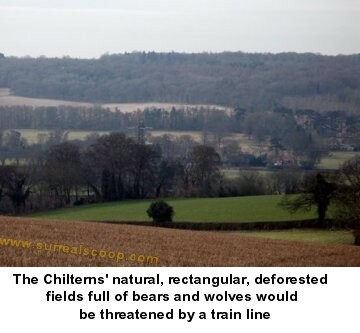 Campaigners trying to save the pristine, virgin countryside they say is threatened by proposals for a new High Speed line from Birmingham to London have run into an obstacle due to their principled stance against countryside damage and compulsory purchases. The campaigners are concerned that the area around the Chilterns, which has lain untouched for hundreds of years after all the forests where cut down for farms and to build the Elizabethan royal navy, may have its character permanently altered by having trains run through it periodically. The obstacle to increased protests is that there is no mechanism by which the campaigners can go anywhere where there heartfelt pleas on behalf of the wolves and bears that where displaced by the clear-cutting of the forests in the middle ages can be heard. The group's revised plans, to take a rail replacement coach trip to Parliament Square, were then thrown into disarray by another member who had recently borrowed a book on transport from their local library, which has since closed. The campaigners have finally solved the transport problem, although they do admit that the revised travel plans will make their journey times somewhat longer as they plan to walk to Birmingham airport and then fly to London.